There seems to be several ways to reset or clear the iOS simulator ranging from pressing the “Reset Content and Settings..” button on the iOS simulator from deleting folder under ~/Library/Developer/CoreSimulator/DerivedData. For me the easiest and faster approach for my workflow is to simply issue the below in terminal. PACKT recently provided the opportunity for me to review the Xcode 4 Cookbook by Steven Daniel. As primarily a Titanium developer I spend most of my time in Sublime Text or Titanium Studio so I thought it would provide a good opportunity to spend more time in Xcode. First, the book title is alittle misleading. I found this book to be more about iOS development then Xcode itself. The author does cover Xcode in detail, but always in the context of building or profiling an app. This approach made it both easier to read and to remember. The book starts with covering the basics and then moves into creating user interfaces. Having built most of my UIs through code it I found the content on Interface Builder and Storyboards helpful. The recipes are easy to follow and very detailed, perfect for beginners. My favorite section of the book is around instruments. Again the author walks us through these recipes in a very detailed easy to follow way. 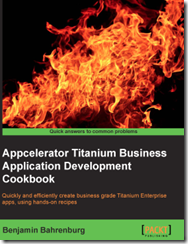 As a side note, you can use the same steps outlined in these recipes in your Titanium project. You just need to generate a full Xcode project using transport.py as detailed here. Coming from a non Xcode background, the navigation and descriptions of the options available for profiling made Xcode’s sometimes challenging interface easy to understand. The chapter on iCloud provided a great “getting started” guide with a clear easy to understand recipe showing on to implement Document based storage using NSUbiquitousKeyValueStore. This was a good introduction to iCloud and very easy for someone new to iCloud to follow along. I do wish the author would have gone further on this topic and provided more details on storing greater the 64k documents. The recipe using CoreImage provides a nice introduction to the topic and discusses a few of the common available filters. This recipe provided a nice transition from the earlier CoreGraphic recipe. I do wish the author would have provides a multi filter example though. Overall, I really enjoyed reading this book and found the recipes helpful. The detail and direction provided by the author makes all of the recipes easy to follow and quick to perform. If you are new to iOS development or Xcode this book provides the resources needed to tackle that learning curve quickly. Xcode is one of those IDEs that you either love or hate ( sometimes both ). Coming from a Visual Studio background it has taken awhile to get used to the Xcode workflow. I’m still hopeful that someone will create a Resharper like tool for Xcode, but until then I wanted to share some of the plugins that I’ve found useful. This plugin provides enhanced auto completion. I bounce between languages frequently and this makes remembering the specific syntax I’m thinking of much easier. Calling this Spotlight for for Xcode would be an understatement. Once you get used to Code Pilot you will rarely leave the keyboard. In short navigation made easy. This plugin seems to be the closest thing Xcode has to Resharper. With 40+ code generation actions and a ton of help this is well worth the small purchase price. This visual plugin provides a color picker when working with UIColor ( and NSColor ). I rarely use this plugin, but when I do it is a time saver. Can’t remember whether that image you just added to the project was called button-separator-left or button-left-separator? Now you don’t have to, because this will autocomplete your imageNamed: calls like you’d expect. Just type in [NSImage imageNamed: or [UIImage imageNamed: and all the images in your project will conveniently appear in the autocomplete menu. Read more about this plugin on Kent Sutherlands blog. XcodeColors allows you to use colors in the Xcode debugging console. If you work with large strings in your code you will definitely want to check out this plugin. You can enter your full string into this plugin’s UI and it will correctly escape and insert the string into your code. This plugin automatically inserting paired message sending brackets. Maybe I’m missing something but shouldn’t Xcode do this for you by default? I recently found a github project by Dave Keck that has several Xcode plugins are extremely useful. My favorite is the CurrentLineHighligher but would recommend checking them all out. Just want to focus on the code? This plugin allows you to reduce the sometimes massive Xcode toolbars. A commenter (Nick) mentioned that JetBrains has a great IDE called AppCode available at http://www.jetbrains.com/objc. With Apple’s latest products, including the iPhone 5 we now have to worry about more form factors then ever. As the method for switching the device type in Titanium Studio is still pretty clumsy I went in search of an earlier way. 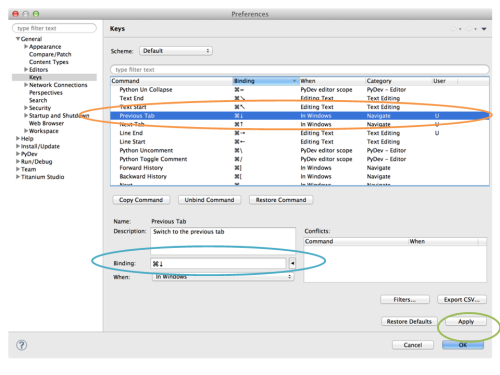 The Appcelerator forums had a great post by Rob Gabbard with an AppleScript helper to do just what I was looking for. With a small update to add support for the Retina iPad and iPhone 5 I can now switch devices must easier. I wanted to share a link to this script for anyone that might have missed the QA post. Unfortunately this doesn’t address the need for the app to be launched again when the device is changed. set thePListPath to thePListFolderPath & "com.apple.iphonesimulator.plist"
View the the gist of the script. I’ve been using Titanium Studio quite a bit lately and noticed the default key mappings for switching tabs was not working for me. Titanium Studio allows you to easily set your key bindings to anything. Below are the steps I used to create my tab switching shortcuts. 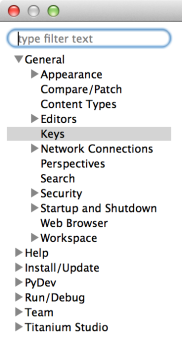 Where is Key Mapping Preferences? 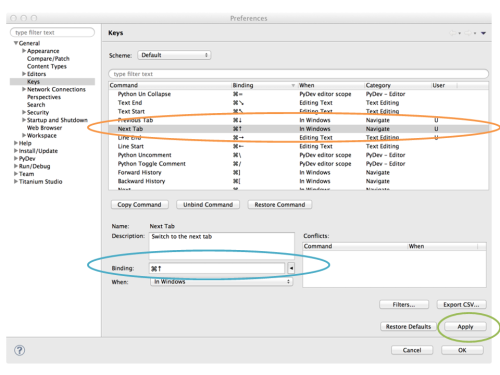 You can updated Titanium Studio’s key bindings by going to Titanium Studio then selecting the Preferences option as shown below. Titanium Studio provides a large amount of preferences, you can tailor almost anything to your workflow. The key binds are found under General then Keys. If you have trouble finding this, just search for “keys” in the filter box. Once in the Keys option menu, scroll until you see “Next Tab”, you can also filter by “tab” and it will help you find this option. Select the “Next Tab” as shown in orange below. Then enter “Command Page Up” in the binding section highlighted in blue. Once completed you will need to press the “Apply” button for this option to be immediately available in Titanium Studio. Once in the Keys option menu, scroll until you see “Previous Tab”, you can also filter by “tab” and it will help you find this option. Select the “Previous Tab” as shown in orange below. Then enter “Command Page Down” in the binding section highlighted in blue. Once completed you will need to press the “Apply” button for this option to be immediately available in Titanium Studio. Now I can switch between tabs just like in my Eclipse projects.